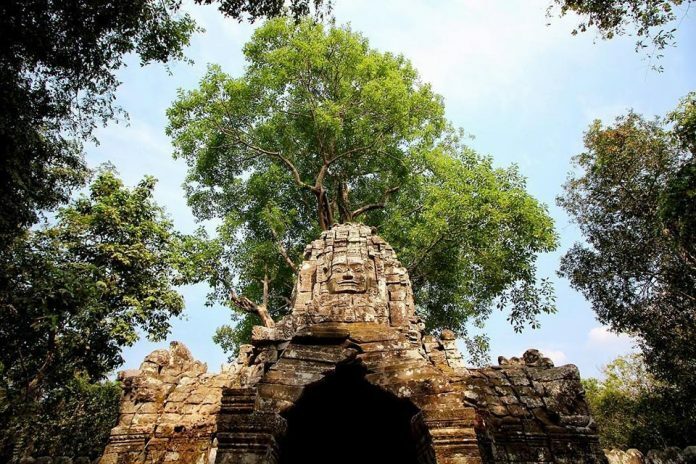 Ta Som's most prominent feature is a huge strangler fig tree which has engulfed the eastern gopura. - Photo credit: @harrison_white (Instagram). They say that good things come in small packages, and that is certainly true of Ta Som. 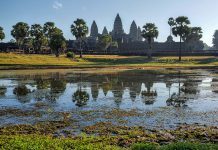 Although it is one of the smaller temple sites in the Angkor Archeological Park, it is definitely worth a look. As with neighboring sites Preah Khan and Ta Prohm, very little restoration work has been done on Ta Som. These sites remain in a state of semi-ruin with the trees and other native vegetation allowed to grow over and through the walls of the temple. 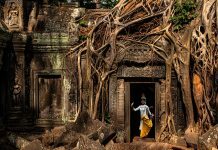 One of the most prominent features of the site is the huge strangler fig tree which has engulfed the eastern gopura or gate. Ta Som also features towers with serene faces on the outer enclosure of this Bayon-style temple. This charming site has many unique photo opportunities you won’t want to miss. Although Ta Som is part of the Grand Circuit, it is frequently skipped by tourists who are more interested in visiting the better-known sites in the park. 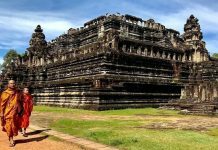 If you choose to visit this often-overlooked temple, you will be well rewarded for the effort. It is quite likely that you’ll have the place to yourself, and you can take your time to explore the site in peace and take as long as you like to examine the well preserved bas-reliefs without being jostled by crowds. The impressive strangler fig embracing the eastern gate is very similar to the tree-covered temple of Ta Prohm made famous in “Tomb Raider”, but you won’t have to stand in line to get a photo, and you’ll have the leisure to take as many shots as you’d like. Ta Som is uniquely beautiful and you’ll enjoy it no matter what time of day you see it, but the best light for photographing the temple will be in the early morning or late afternoon. 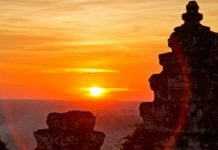 Ta Som is located in the northeast section of Angkor Archeological Park, on the east side of the man-made lake called Javatataka Baray. There is an island in the middle of this lake where the Neak Pean temple is located. Visitors doing the Grand Circuit will usually arrive at Ta Som by way of Neak Pean, and then proceed to East Mebon. Although the temple was originally designed to be entered from the east, modern visitors will enter Ta Som from the west side, crossing below the face tower located on the western gopura. 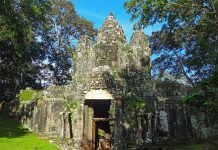 Ta Som was built during the late 12th century by the great King Javayarman VII. Little is known about the purpose of this temple, but it may have been dedicated to the King’s father or one of his teachers. Ta Som was swallowed up by the jungle until the 1930’s, when it was cleared out enough for visitors to access the site, but left in its mostly unrestored state. This Bayon-style temple is surrounded by a moat and three separate enclosures constructed of laterite, which is a rusty-red colored rock common to tropical climates. The first or inner enclosure features four corner towers and four gopuras, and face-towers with four faces looking out in each of the cardinal directions. The second and third enclosures are separated by the moat. These outer enclosures mirror each other as they both feature two gopuras, on the east and west side. The face towers are King Javayarman VII’s signature, and are featured in many of the temples built during his reign. Most historians believe that the faces are meant to represent both the king and Lokesvara, the bodhisattva (enlightened being) of compassion. 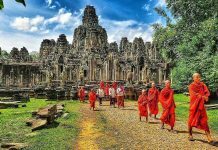 Like many temples throughout the Angkor Archeological Park, Ta Som depicts both Hindu and Buddhist icons, as the official Angkor religion switched back and forth over the centuries. Sadly, some of the depictions of the Buddha were damaged in the 13th century when Hinduism overtook Buddhism for a time. However, considering its great age and the depredations of the jungle, many of the bas-relief carvings are in surprisingly good condition. If you have the time, try to visit this small but lovely temple. You won’t be disappointed.